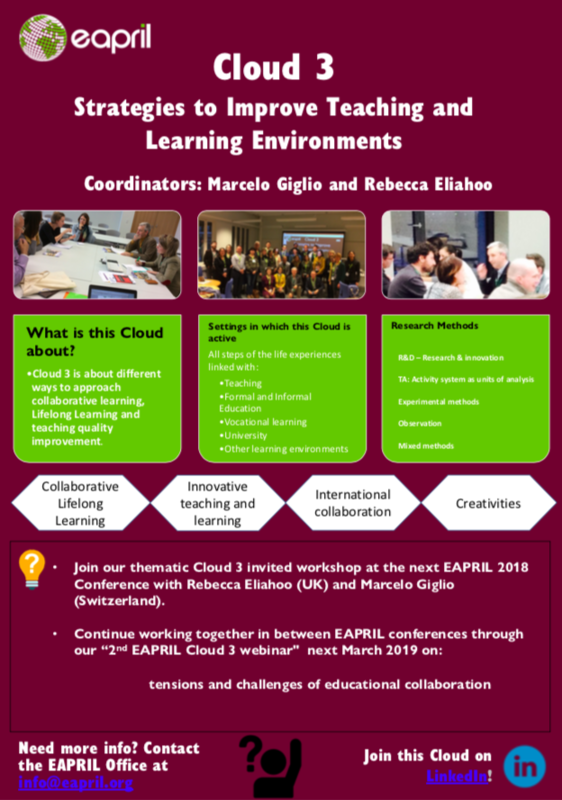 We would like to invite you to submit your Present & Discuss topic for a Cloud 3 Symposium during the EAPRIL 2019 conference in Tartu. This is an opportunity to discuss topics in the frame of a symposium and to contribute towards improving teaching and learning environments and/or collaborative learning and/or lifelong learning. This cloud involves studies and projects related to approaches to teaching or coaching, instructional strategies, didactics and other pedagogical strategies adopted while teaching, tutoring and/or coaching learners. Also the design and set up of specific learning environments by educators might be of interest. In other words, this cloud aims to build a network of projects leaders and practitioner-researchers who are interested in how educators approach their teaching, training, tutoring, or coaching, how they act in the classroom or training context, and/or how they set up specific learning environments or implement specific didactics. Clouds 3 and 12 organized an interactive webinar at the start of summer on July 3, 2018. Loes Van Wessum, Marcelo Giglio and Rebecca Eliahoo presented and discussed on the topic: "How collaboration can contribute to the professional development of teachers and leaders in education."